NOAA Fisheries has released the draft final report of the "Independent Science Panel of the Bilateral Scientific Workshop Process to Evaluate the Effects of Salmon Fisheries on Southern Resident Killer Whales." Southern Resident killer whales are listed as endangered under both the U.S. Endangered Species Act and Canada's Species at Risk Act. New scientific information and analyses about the Southern Resident population and the extent of their reliance on salmon - particularly large chinook salmon - strongly suggest that chinook abundance is very important to survival and recovery of Southern Residents. "This relationship has potentially serious implications for salmon fisheries and other activities that affect the abundance of chinook salmon," says NOAA Fisheries. Comments are due on draft report by June 15. The National Marine Fisheries Service (NOAA Fisheries) and Fisheries and Oceans Canada have developed and adopted recovery plans for SRKW as required by their respective national statutes. One of the potential threats to the recovery of SRKW may be a reduction in salmon prey available to SRKW due to salmon fisheries, according to the draft report. During 2011-2012, NOAA Fisheries and DFO commissioned a series of three scientific workshops to explore the evidence available to determine to what extent are salmon fisheries affecting recovery of SRKW by reducing the abundance of their available prey, and what are the consequences to their survival and recovery? The Independent Science Panel consists of seven scientists from the United States and Canada chosen for their expertise in population dynamics, marine mammals and fisheries. The Independent Science Panel was provided with a large collection of documents prepared by agency science teams and other scientists, as well as presentations at the first two workshops. Between Workshop 1 and Workshop 2 the panel requested various forms of further information and analysis from agency staff, and received input from other stakeholders based on presentations at Workshop 1. The underlying hypothesis presented by the two agencies is that SRKW are highly dependent on chinook salmon, that the rate of increase of SRKW is higher in years of high abundance of chinook, and that reductions in chinook harvest would lead to an increase in SRKW abundance. Over the last four decades, the SRKW population has been increasing at an average rate of about 1 percent per year, far short of the 2.3 percent per year established as a goal for downlisting or delisting under the ESA. The panel found that the evidence for high dependence on chinook salmon during the summer is convincing. There is also a statistical correlation between periods of lower chinook abundance and higher SRKW mortality rates. However the panel cautions that this correlation does not imply causation, but rather both could be caused by another environmental factor. There are also concerns about whether the index of chinook abundance accurately reflects the Chinook stocks most important to SRKW. Currently chinook stocks are harvested at a rate of about 20 percent, so there is limited potential for increasing chinook abundance by reducing fishing pressure. The panel also found that there are concerns that forgone harvest may not result in proportionally higher chinook abundance because (1) all chinook foregone from harvest may not be the stocks that SRKW depend on, (2) all chinook foregone will not be mature and available to SRKW, and (3) there are many competitors for chinook salmon, particularly other marine mammals, and they may consume additional chinook before they are available to SRKW. Overall the panel felt that the estimated impact of chinook catch reductions on SRKW should be regarded as a maximum estimate and that the realized impact would likely be less. 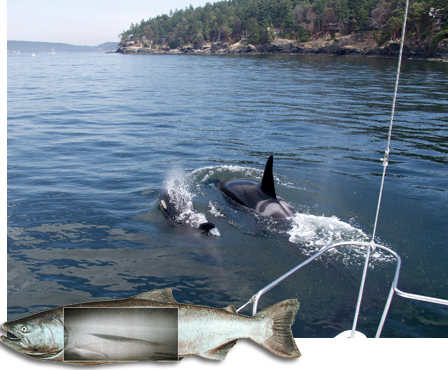 The panel recommends that research in the near term should emphasize (1) further photogrammetric analysis of individual SRKW body condition, (2) use of contaminant data to determine if the indices of chinook abundance used in the statistical models accurately reflect the chinook stocks important to SRKW, (3) revision of models to allow for the simultaneous mortality due to other predators on chinook salmon and (4) an ecosystem view of factors affecting SRKW. For more information and the full draft report go here.